Kleijn Nurseries and Garden Centre – Happy plants, happy people ! Kleijn Nurseries and Garden Centre is a personable family run business, with over 30 years of experience growing and caring for plants in Nanaimo. 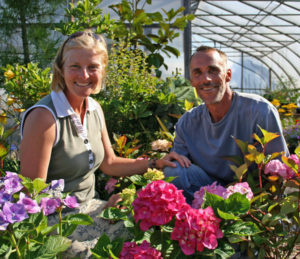 Proprietors, Catherine and Nol Kleijn, offer personal and friendly service, expert advice, and a great selection of quality plants and supplies to suit every home and commercial garden, or landscaping project. Come visit our ever expanding grounds, conveniently located along the Island Highway, a few minutes south of Nanaimo. Open daily, 10 – 5. We accept cash, debit and all major credit card; gift certificates available. We take orders! We will advise you when the order can be picked up at our South Nanaimo nursery location, as we do not ship orders.